This article is about the ingredient used in Provisioning. For general information about the game, see Online. Game is an ingredient used in Provisioning to make a variety of Food dishes. As a meat-type ingredient, all recipes using game will have an Increase Maximum Health effect. 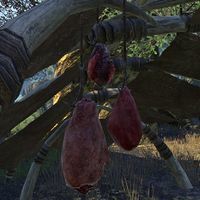 Game may be found in containers throughout Tamriel, and may also be found hanging from hooks or strings in cooking areas or camps. You may also find game by hunting the larger passive animals, such as deer or antelopes, or also goats, though these are usually domesticated and killing them may be a crime. This page was last modified on 28 January 2017, at 16:01.